So one of the things I'm finding so attractive about 3rd edition is the set of rules for baggage trains. Ok, it might get annoying if they were a feature of every game, but for particular scenarios and campaigns, they are fantastic. I'm quite keen to build a baggage train for my high elf expeditionary force, and I have a vaguely appropriate cart, but so far only one appropriate unarmed fellow to accompany the baggage. Or do you just skip the baggage rules? If you are rich you could use Citadel's many Townsfolk ranges. They are very varied and considerably collectable. Or you could use the Foundry to pick suitable models, or indeed any other manufacturer. I tend to use a cart and a few horses to represent a baggage train anyway. Perhaps you could do something similar? lenihan wrote: So one of the things I'm finding so attractive about 3rd edition is the set of rules for baggage trains. Ok, it might get annoying if they were a feature of every game, but for particular scenarios and campaigns, they are fantastic. I'm quite keen to build a baggage train for my high elf expeditionary force, and I have a vaguely appropriate cart, but so far only one appropriate unarmed fellow to accompany the baggage. For Dwarfs, I like the pony with mine car that was sold with the Battle for Skull pass set. That's what I'm planning on using for the train anyway. and a wood elf lord and lady. Mithril do some, might be worth poking around their site. Last edited by Zhu Bajie on Wed Aug 21, 2013 8:52 pm, edited 2 times in total. Very nice suggestions, thank you! Those otherworld hirelings look particularly good, though the website doesn't seem to offer them on sale at present? 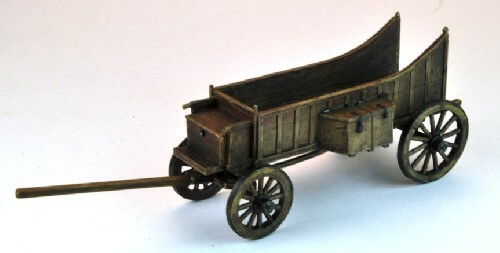 It's a South African wagon from North Star figures (that's their image of it from the website). Having now assembled and started to paint it for myself, it looks a little more modern than I was hoping (what was I expecting for a Boer-war period model, I guess), there's something about the shape that I find in keeping with the high elf aesthetic, but I'll just have to see how it works when I'm finished. It'll do for now, anyway. If you paint the wagon in colour as opposed to plain timber it should look less historical and more fantastical. Maybe some woodland garlands and the like as well. With the right paint-job that wagon could be perfect for HE. the Otherworld hirelings in the photo are an indiegogo exclusive, but they have more like them on the way (including a small cart). I think you guys are right about the paint job being what matters on this. I've painted it timber for now, but I'd welcome advice from people at the Oldhammer weekend (or in general) on alternative styles. Just John's idea of woodland garlands bringing something to it is a real winner though, I think, going to look into that in the meantime. It is important to think a little outside the box for some races, notably undead but others too. For high elves surely pavilions and organised tented barracks are the order of the day rather than a bedraggled bunch of camp followers. We also used to use wounded figures. There is a nice Jes war dancer with his head bandaged that is reasonably common and cheap (I may even have a spare you can have), others to use would be bards as noted, watching high class civilians, just like the Victorians used to do, even the odd actual guard. Try reaper for more civilian looking elves. It would seen that Megaminis have sold the Elf Villager molds to Turnkey http://www.turnkeyminiatures.com/ They might be woirth looking at when they are up and running.